My friendship with Sean goes back almost twenty years now to the time when I was based in his home parish of Corpus Christi, Drumcondra. We got talking after Mass one day and I suggested to him that he might like to become a Minister of the Word in the parish, which he has been ever since, as he is here in the parish of Gardiner Street. As I got to know Sean, I realized I was in the presence of a wonderful writer who had honed his craft writing plays for radio as head of radio drama in RTE. I recognized that many of his plays related in some way to the narrative of the passion and death of Jesus in the gospels. It was clear to me that he had a really strong desire to present this Passion narrative in the form of drama, but not in the conventional format of a passion play. He wanted to come at this dramatic gospel story in a very different way, in a way that would engage people not just within the community of faith but beyond it. He introduced me to one of his radio plays on the theme of the passion, At the Praetorium, and I suggested we put it on in Corpus Christi parish church in Holy Week. Sean jumped at this opportunity and, with a cast of parishioners, the play was staged to great acclaim. When I was moved to the parish of Saint John the Baptist in Clontarfin 2007, I was very keen that At the Praetorium would be staged in our parish church around Holy Week. Indeed, in Holy Week 2008, the play was performed in three different church venues, two of the parish churches in Clontarf, and the church in All Hallows College. In the following years we put on two other plays of Sean that were inspired by the Passion narrative of the gospels. The first was the play, Pilate under Pressure, which was a combining of two of Sean’s plays, At the Praetorium and Three for Calvary. The second was the play,Veil. Sean went on to adapt Veil for radio, and as he says in his own notes at the end of the book, ‘adapting what was essentially a stage play for radio was quite a challenge, entailing edits and rewrites’. However, as anyone who knows Sean is well aware, he just thrives on a challenge. The radio play was first broadcast on RTE on Good Friday, 1982. 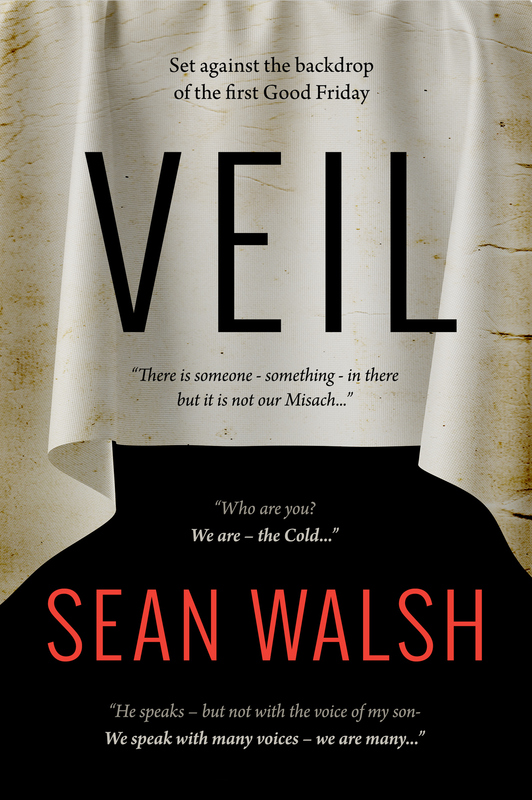 I am delighted to see Sean’s revision of Veil come to publication in this lovely print form. Catholics of a certain generation will associate the name ‘Veronica’ with the sixth station of the cross, ‘Veronica wipes the face of Jesus’. This is one of the Stations of the Cross which has no basis in the gospel story of the passion and death of Jesus. Luke mentions the weeping women who met Jesus, but no gospel writer refers to Veronica. There was a very early tradition which emerged after the gospels were written of a woman who used her veil to wipe the sweat from the face of Jesus during his agonizing way of the cross. The veil was then found to bear a perfect likeness of the Lord’s face, and it subsequently became known as the Vera Icon, the True Image, and, hence, the woman’s name, Veronica. Sean has taken this revered tradition and, with his wonderful imagination and powerful literary skill, he has transformed it into a work of dramatic art. It is a play in eight scenes, which moves along at a breath-taking pace towards a powerful conclusion. The play looks at the drama of the events of Holy Thursday night and Good Friday through the lens of Veronica’s family, Veronica herself, her father Azarias, her mother Ruth, her younger brother, Misach, who is possessed by an evil spirit. There are two other main characters who are from outside this family, the man in love with Veronica, Benjamin, who is an anti-Roman rebel and Sadoc, a pompous member of the Jewish Sanhedrin. The play explores the enormous impact on this family of the crisis that was engulfing Jesus during more or less a twenty four hour period. The crisis that was engulfing Jesus created a crisis in this family. As we read the play, we are left wondering how this family crisis will be resolved or, indeed, if it will be resolved. When I read this play again, I was again in awe at the imaginative and literary skill of Sean in bringing together the story of each of these two crises. The story of Jesus’ crisis is always off-stage. Reference is made to it by various characters in the on-stage story, which is the story of the crisis in this family. As the crisis of Jesus comes to a head, so too does the crisis of this family. As Ruth says in the course of the play, ‘The Nazarene has thrown our household into confusion’. I doubt you will come across an angle on the story of Jesus’ passion and death which even remotely reflects what is to be found in this play. It is truly sui generis, one of a kind. The full drama of the play is best experienced when it is staged and viewed. Yet, reading the play is itself a very moving experience because the dialogue is so pacey and so beautifully crafted. The reader is carried along by the momentum of the dialogue. It is as if the pace of the dialogue reflects the pace of the events which are unfolding just down the road from this family’s home. On reading the play again, I was struck by the complexity of the relationships between the characters. Ruth’s relationship with her possessed son, Misach, is marked by warmth, understanding and hope, whereas Azarias’ relationship with his son reveals disgust, sadness, disappointment at what his son might have been. Veronica’s growing fascination with Jesus leads to a growing tension in her relationship with her mother, and especially with her father. Then there is the relationship between this family and Sadoc, a leading member of the Sanhedrin, the group of religious leaders who want to bring about the death of Jesus. It is above all through Veronica and Sadoc that the drama engulfing Jesus impacts on the life of this family. Veronica and Sadoc are polar opposites in terms of their relationship with Jesus, and these two opposing forces threaten to break the family cohesion apart. In the conflict between Veronica and Sadoc, Azarias finally sides with Sadoc, consenting to the Sanhedrin’s condemnation of Jesus to death. One of the most moving scenes in the play is between Azarias and his wife Ruth, when Azarias is conscience-stricken by what he has done the evening before at the meeting of the Sanhedrin, ‘I failed… I failed him, myself, the Law, the prophets’. Too late, he has come to realize that Veronica’s challenging voice was the one he should have been listening to, rather than Zadoc’s beguiling voice. I hope I have given you some little feel for this powerful and thought-provoking play. It is my pleasure to launch this new publication of a wonderful piece of writing. I can only encourage you to take hold of it, to read it, and to promote the play in whatever way you can, preferably by inviting some local drama group to stage it, so that others come to experience its power and beauty.